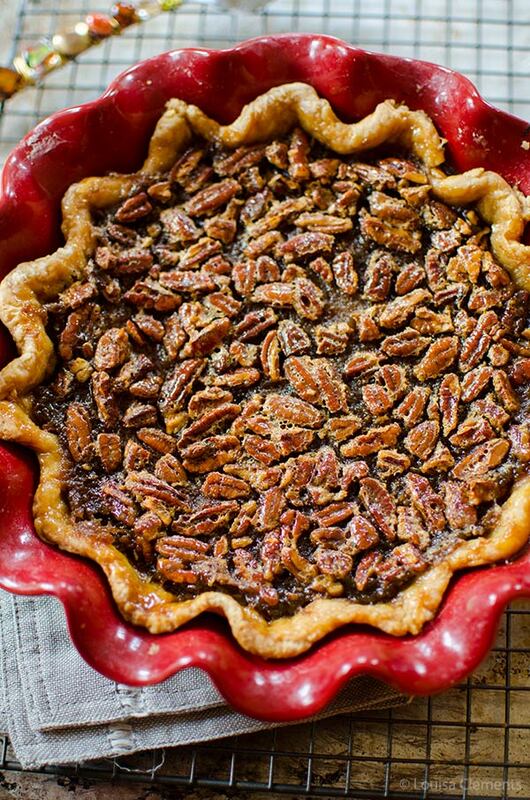 Combine two Thanksgiving pies into one with this layered pumpkin pecan pie. A spiced pumpkin pie layer on the bottom and gooey pecan pie layer on top. I can never decide which is my favourite kind of pie, pumpkin or pecan? I’m seriously lacking in pie recipes on here, so I figured I should try something a little crazy and combine the two flavours into one layered pumpkin pecan pie. I’m here to report that it worked! This was quite the arduous task (and by that I mean that I had a pie in my fridge for a month – ha!). For this pie recipe you’ll get the flavours of both pumpkin and pecan which really is the best of both worlds, don’t you think? 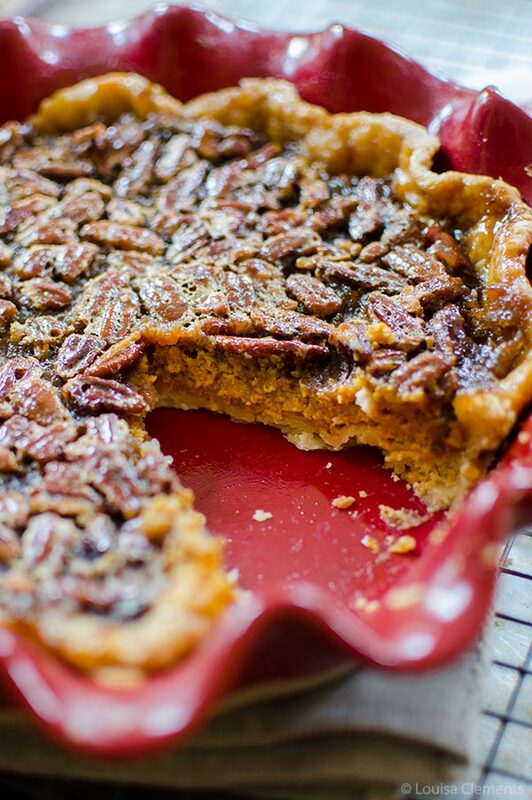 You’ll find your typical pumpkin pie on the bottom layer and then a gooey pecan layer on top. This recipe is basically everyone’s favourite Thanksgiving pie in one, and the solution to your Thanksgiving dessert problems. Thanksgiving week has been about giving you the solutions to some on the food hang-ups you might face on Thanksgiving. So, if you’re cooking for a small group or are just plain intimidated by a whole turkey (it’s ok, me too! ), erase those thoughts from your mind and pull out the slow cooker and make slow cooked turkey breast. This is guaranteed to build your confidence in the kitchen – no one will believe that you didn’t roast it for hours in the oven. If you’re heading to a potluck and need a dish to bring, I’ve got the recipe locked and loaded; stuffing. Everyone loves a big dish of stuffing and it’s a must-have – I don’t think Thanksgiving can exist without it. As much as we all love turkey and stuffing, we all know that it’s the pies and desserts that are the real showstoppers. 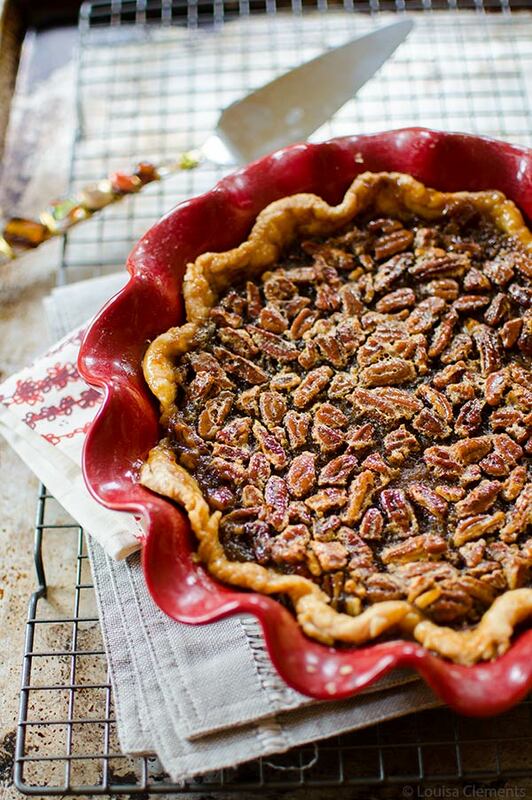 So, what’s the story with this pumpkin pecan pie? Well, the first time I made it, it was an epic failure, as is the first test of many recipes. Did you know that I test every single recipe that I post on here? And when I say test, I mean I typically make everything multiple times, until it’s finally perfect. I want every recipe I share to work for you in your kitchen. This is something that is really important to me as someone who has been running a food blog for over five and a half years; it’s the quality of the recipes that people remember. I’ve tried recipes from other food blogs over the years and had them fail on me. This is not only frustrating, but also a waste of money and a waste of my time. I don’t want that to happen to anyone when they try out a Living Lou recipe. 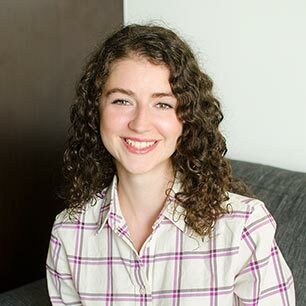 I love getting your feedback so next time you try something – let me know what you thought, leave me a comment or send me an email, happy to answer any and all questions about a dish. After the initial failure, I wasn’t ready to give up on this pumpkin pecan pie. I consulted with quite a few people about getting the pie to bake in separate layers and not have the pecan layer sink into the pumpkin filling. The answer? A double bake. First, the pumpkin layer is baked, then you add the pecan layer on top. Baking this pie in two parts allows you to have the beautiful look of separate layers. It doesn’t overcook and you get a beautiful look with separate layers. I like to serve this pie with a dollop of whipped cream (like a spiked, bourbon whipped cream, if you want to really go for it) or a scoop of vanilla bean ice cream. In a large bowl, stir together flour and salt. Using a pastry blender or your hands, cut in butter until coarse crumbs form. Using a fork, stir in ice water, 1 tbsp at a time until a soft dough can be formed into a ball. Shape dough into a disk and wrap in plastic wrap. Refrigerate for 45 minutes to an hour. Roll out dough on a lightly floured surface into a 13" circle. Transfer dough to a 9" deep dish pie plate, trim the excess dough leaving 1/2" overhang. Fold the overhang underneath and use your knuckles and thumbs to pinch the dough around the rim to form a decorative edge. Line the dough with a piece of parchment paper and fill with pie weights or dried beans. Bake for 18-20 minutes. Remove from oven and carefully remove parchment. Cool completely. In a medium bowl, whisk pumpkin, whipping cream, egg, brown sugar, vanilla, spices and salt. Reduce oven temperature to 350. Cover edges of pie crust with foil. Pour pumpkin mixture into crust. Bake in the centre of the oven for 25 minutes. Remove from oven and cool for 10 minutes – keep foil on edges of pie. In a medium bowl, whisk corn syrup with brown sugar, egg, vinegar and vanilla extract. Stir in chopped pecans. Carefully pour pecan mixture overtop of pumpkin filling. Bake for 35 minutes, remove foil during last 10 minutes of cooking. Remove to a rack and cool completely. Give this pumpkin pecan pie a try for Thanksgiving, let me know how it goes in the comments below.